What does it mean to be any of the following in relation to driving opportunities? I was just talking with someone who mentioned they use the 16 hour (HOS) exception once per week. Supposedly you can use it once every 4 days but for their purposes it equates to once per week. Can anyone using this 16 Hour (HOS) exception share their experience and practical use of the of the rule? What do you think of the transportation bill that has in it a guaranteed pay for drivers of all on-duty hours? The name of the bill is: "Grow America Act"
I'm talking about the "On-Duty" sitting around time maybe hybrid model. I don't want to just sit somewhere and get paid, I want to drive but here is a perfect example of not getting paid. I drove a little over 200 miles into a rural area from Chicago. It took me about 4-1/2 hours based on where is was located. I got to location for delivery and it took me three hours to get live unloaded. Then I spent another 1-1/2 hours getting to next location where I'm suppose to pick up my next load. I get there only to find out the next load will not be ready for another 7 hours. I had been calling my dispatch since my first stop trying to find out what I'm picking up and where and of course the dispatcher I'm suppose to speak with is always too busy to talk to me so the other dispatchers just keep telling me to go to next location and call us from there. They knew the load wasn't going to be ready and I'm a Home daily driver. I'm suppose to drive 200 to 300 miles and back every day. Obviously, dispatch says they don't have anything else and in 7 hours I can go ahead and get going. Never mind how you are suppose to manage your time. I think this is where the abuse of driver comes into play. I'm a former white collar guy who just started trucking to make some money and get insurance while I'm pursuing my other late in life options. As a white collar guy I never realized how badly or poorly truck drivers (maybe it doesn't only apply to truck drivers) were treated until I became one. I've heard terminal managers talking about recently hired drivers who have already quit saying, "think about how much free money we made of that guy". Its a little insulting and very demeaning. Anyway I think getting paid a minimum for any down time is a great way to make companies or maybe the dispatchers be more accountable. Hey my time is valuable, I became a driver to drive not sit around and make an hourly wage to do nothing. Now that I've been driving for 7 months I can really see some of the abuses. Anyway I'm hanging in there to get my one year experience then look for a better place. I'm sure every company doesn't have the mind set of how do we screw everyone but there are some that do. I think the hourly thing would especially help the drivers who perform shorter run work. Happy Easter. You work way more hours than a normal worker and all those off duty hours you are working to save clock because you only get paid for miles. Experienced truckers need to chime in on what move to make so im always getting paid. I like otr and the job but all this unpaid work is ridiculous. I'm on the 6 month marker with same company. Many a day I say to myself WTF! How did I get myself into this, what a waste, blah, blah, blah. I've had that talk with myself many a time. Instead of quitting I'm using this as an incubation and learning time. Drive safe, practice every back in, test myself on blind backing when in an unpopulated dock area, do good pre-trips and safety checks writing up issues on trailers, etc. I also do little time studies on myself. How long it takes to go to destinations, how long to refuel, how long it takes to do a double and triple drop and hook, etc. I just try to learn everything I can so I can communicate and ask better questions of the next company I might go to. Now that I have 6 months there are more companies interested in me as a driver. I'm calling companies to find out what they paid and how things work now that I know what sitting around with unpaid hours is. I'm using anytime I'm idle to spark up conversation with other drivers about how they like there companies. If I see a truck company that I think might appeal to me I try to find an idle driver form that company at one of my stops to get the inside scoop. There are so many different type of gigs for drivers. I'm trying to figure out what is the next best move instead of being another new guy just jumping ship because I'm ****ed or now I recognize I'm still too ignorant to make the next right or best choice for myself. I'm asking everyone, define local, define regional, define 80% no touch freight (what do I have to be doing with the other 20%), define what a run is, define, define, define. I don't want to jump out of the frying pan into the fire. I look at it this way, the pay might be low now, but I'm a Professional Driver. Notice I say Professional Driver, not trainee, driver, truck driver or any other title. So when I look at it that way, I figure if or when I go tot he next company I am, should be treated and should be paid as a Professional Driver. Anyway, that was a little long winded but my 2 cents. Try to find out what radio stations in your area carry the "weather band" station. There are also "weather apps" for some "smart phone." Yes, I'm trying to triangulate between apps and website to get best information. I found a neat map online with driving directions through Indiana: Link - Road Report with Route http://indot.carsprogram.org/#roadReports/pickARoute Purple on the route is difficult, Blue is fair and gray is good. Check it out. Thanks for all the great advice! I'm still here at the same company. February will bring in my 6 month mile marker at the same company. Things are in fact settling down. I'm starting to get some decent loads and runs. I'm also now in a Day Cab so I'm actually get home daily. Not much time home daily but enough to see the wife, have small bite to eat, tuck my daughter into bed (even though see is already asleep) and get some sleep myself. My wife and daughter like it better that I'm home daily too. Its a little more predictable. When driving the sleeper I never knew, where I was going, for how long or how late I'd be home on Friday (I was getting home mainly on weekends\). Also, early in your career you don't know what you really want out of trucking. I have to admit this statement is very true. Since being transferred to a Day Cab from a Sleeper Cab about a month ago I can now see more clearly some of the "what do you really want out of trucking" means. Maybe like you have all said I've been road tested (still being road tested) but getting more established with the company. Anyway, I wanted to give my update and thank you all the the great comments, advice or Internet coaching. I'm certainly more enthusiastic now and looking forward to seeing what the next 6 months will bring. What is the catch with Hourly CDL driving job? From time to time I see advertisements about driving for a company at an hourly wage. You would think that is not a bad gig, but what's the catch, drawbacks, landmines when it comes to these hourly type positions? Happy Thanksgiving to you all! Enjoy this special day! It`s just a start up issue. You are actually in a better place than a lot of drivers who are in this business. My advice would be to keep doing what you are doing and you will be rewarded. Thanks. It's 12:01am Got to roll! This is my third month driving truck and the urge to quit is high. But like the advice given, I'm gonna grit my teeth and survive my first year. Good for you. I have to admit there is some satisfaction learning to drive, getting good a shifting and downshifting and especially backing. I'm trying some blind side backing when the opportunity arises and there no one else around or there is an empty yard and I need to drop and hook a trailer. Just very hard getting started. Tell me if this is just trucking, start up issues or WTF? I've been reviewing my weekly runs and hours, etc. I'm getting up at 2am not getting home until 7pm, driving 425 to 450 miles a day (that is actual miles so according to PC miler I'm getting paid on much less) so at the starting rate I get paid I'm making if I'm lucking $125 to $150 a day. I'm on a home daily program is what they call it but not much quality of home daily and definitely not a survivable wage. I'm told by dispatch I need to be somewhere by 7am; I'm up by 2am get to my destination and then I'm told they don't have anything for me. I'm told to drive to the terminal and wait. After a half hour I call, nothing, after an hour I call nothing, almost two hours later I'm told they have something ready for me, Yeah! I drive over to the location only to find out the load hasn't been started (not a drop and hook as they told me) so I have to wait another three (3) hours to get live loaded. I'm also told by the shipper the load I was sent to pick up wasn't scheduled to be done until 3:30pm in the afternoon and it's only 11am now. I asked my dispatched why I'm there at 11:00am in the morning for a drop and hook when they tell me the order is scheduled for a 3:30pm load time. All they can say is they don't control what goes on at the customer (You know I'm thinking BS). Anyway, this is becoming more and more of an issue. I have to make a liveable wage and have some respect for my time. What is really frustrating is all I hear about is how they need drivers and don't have any drivers and how drivers are quitting. But on the other hand they have a core group of drivers who have these gravy train routes. I know because I got sent out of my normal pattern to deliver something and spoke with a coupe of drivers who are doing simple drop and hooks all day. Four 125 mile runs everyday just dropping and hooking trailers and all highway driving and they are done in 10 hours. By the way, don't know if you recall but I'm new to trucking, period, about 3 months solo company driver now. I'm really enjoying the driving and the backing. I'm planning on having a discussion with my company to try to improve things instead of just jumping ship. I need to investigate what other types of runs there are and just ask my employer, "How am I suppose to make a living making $125 to $150 a day working from 2am to 7pm". I just have to let them know I can't sustain that schedule especially without a payoff. What do you think and any advice on situation, strategy, approach or is that just trucking? Overall it's O.K. You make a good point. I'm still trying to figure out what I want to get out of this new crazy career called trucking. I'm new to trucking period. I feel a little like the Iowa farmer Ray Kinsella (Kevin Costner) in field of dreams when he is explaining his life story in the beginning and says until then he never did anything crazy in his life. Well I feel a little bit that way, I never did anything crazy in my life, until I became a truck driver. I on the other hand I'm definitely earning my stripes. Going into the Chicago ghetto at 1am in the morning to drop and hook (areas I wouldn't go into during the day mind you), although there was an unmarked K-9 patrol unit parked in the street near the drop location. They tell me the load has to be at a certain location by 8:30am and then I get there and find out I only have to drop it in the yard and they will get to it when they are ready. I joined OOIDA to learn more about the business overall, because my wife is more of the path of if you like driving maybe you should do it for yourself. But I'm not so sure. I'm sure there are many perils along they way. I speak with the guy who hired me every couple of weeks. He always asks if I feel like quitting yet. I tell him there are some days I feel like that. He does say if you can make it a year with our company you will probably retire with us. He also said that at the recruiting meeting he had at the CDL school. That was one of the reasons I chose this trucking company. I'll keep you posted with more as things go along. Or you could say, "I tried it once but never exhaled", just kidding. 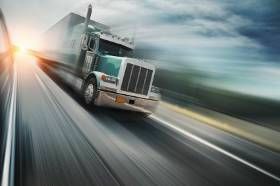 Why is it so important to stick with your first choice of trucking company for 1 year regardless of how well you like it or how well it is going? I mean, I guess that is really like any other job, but with all the options out there what is your thinking. I believe you wrote a blog about staying no matter how bad ... make that one year mark. What are your thoughts? I've been with my choice about 2 months wondering if I made the right decision. Thanks.